This review pretty much speaks for itself. This pen really doesn't have a place in my selection anymore. I am not trying to slam anyone's preferences but, if you like this pen, there are probably several better ones out there that you would like more. 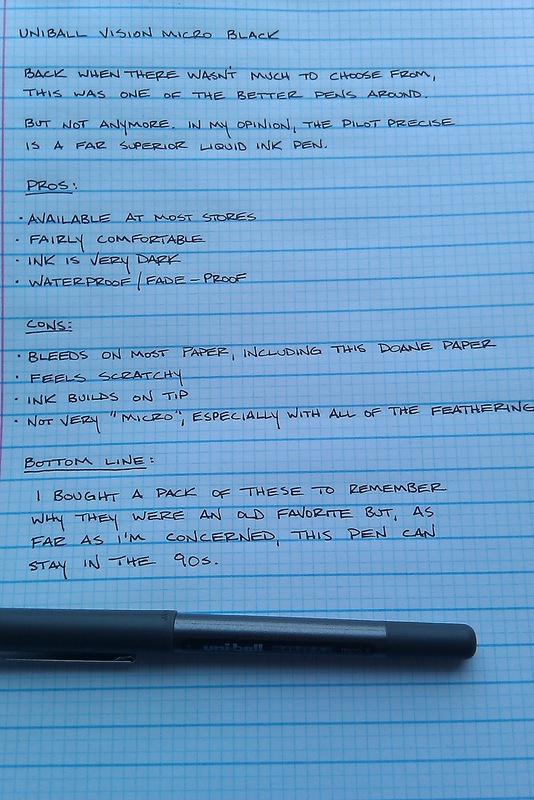 I do like some of the other pens in the Vision line, but I can easily pass on this one. 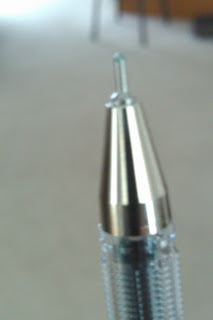 Shown above is the .7mm Pentel Slicci, one of the best needle point pens you can get, at least for performance and variety, but I do have a few issues with this pen. 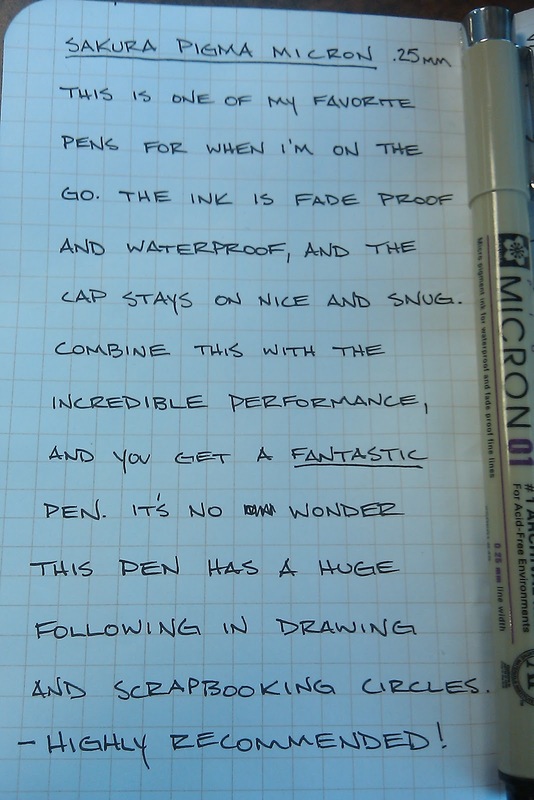 As I indicated in the review, the pen writes very well, but the darn barrel is too slim, especially if you have larger hands. I'd say Sliccis are great for when you are not writing more than a few paragraphs, but you are likely to feel some hand cramping and fatigue during longer stretches. The clip could be stronger, too. It feels like it could crack off pretty easily due to the side-to-side sway it has with even light force. If your arsenal is in a pen case or your pens just mostly sit on your desk, this is unlikely to be an issue for you. At any rate, the color is fantastic, and I have loved all of the colors and point sizes that I have tried. I know the The Pen Addict took issue with the nib point on this particular size, but I did not experience the same thing, at least not yet. Normally I go for the smaller Slicci sizes, but I had not tried the .7mm yet, and I do (mostly) like it. You can get this the Slicci in a .25, .3, .4, and .7, and I think the .3 is my favorite, especially for writing notes in the margins of my academic reading. I have not had a chance to try the .25. 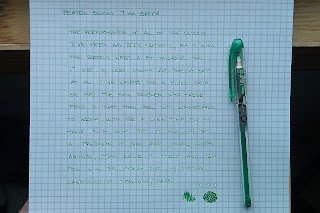 For some other opinions of this pen, check out Office Supply Geek's review and The Pen Addict's review (same link as the one posted above). 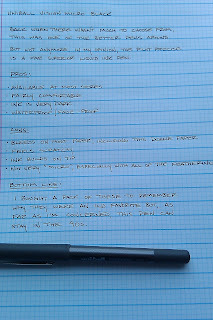 When you need a small, high-quality notepad, this is one of the best you can find. As evidenced by the specs on the back, you get 80 sheets of 80 gram paper, and the pages are perforated. At only 2" x 3", this notepad will easily fit in your purse or pocket, and you will barely notice, making it extremely convenient. 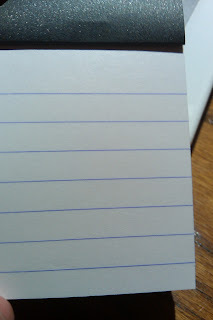 With only seven lines in the ruled version (vs. the graph version), this notepad gives you just enough space to jot down an address, phone number, website, or whatever other little tidbit of information you need to take down. Or you can rip out the pages if you wish, as I often do when I am giving a recommendation to someone. 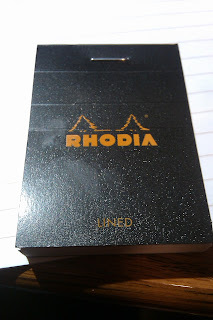 Like many of the Rhodia notepads, this has a fold-over cover, meaning there are lined grooves so the cover can cleanly fold over the top and wrap around the back, letting you focus on what you need to write down. I have found these for $1-$2 U.S. online, and in stores, and it is the notepad I keep in my car at all times. 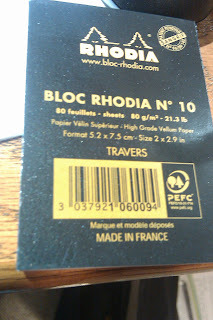 While the size may be a bit too small for some, I have a hard time finding any faults with this notepad. 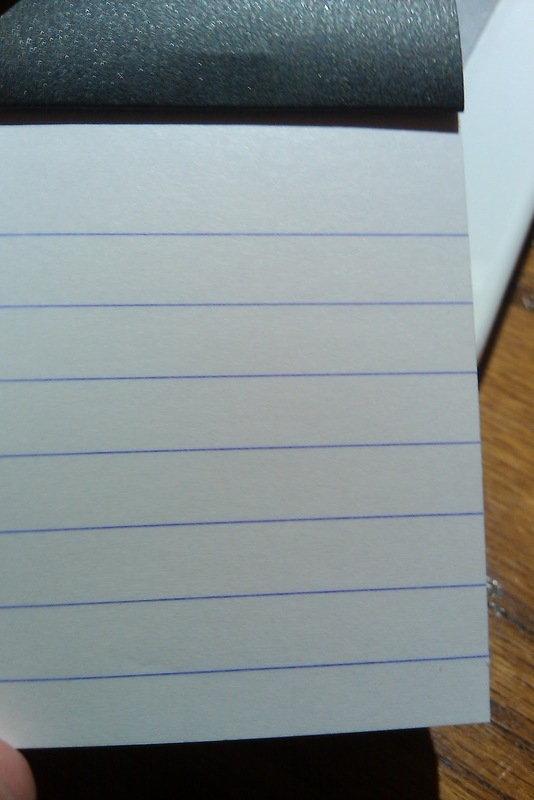 If you have other notepads around this size that you recommend, please let me know. If you like to have variety in color and tip sizes, you can probably find a Sakura Pigma Micron that fits your preferences. I love these pens, and I think everyone should try them, especially if you want ink that is archival quality and waterproof/fade proof. The tip on this .25mm model has a very small tip, but it seems to handle my abuse pretty well. The clip is small, yet functional. The barrel is nice and slim and, though there is no grip, the pen is comfortable to hold. 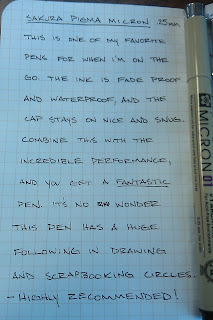 This is pretty comparable to the Copic line of pens, and both are fantastic. 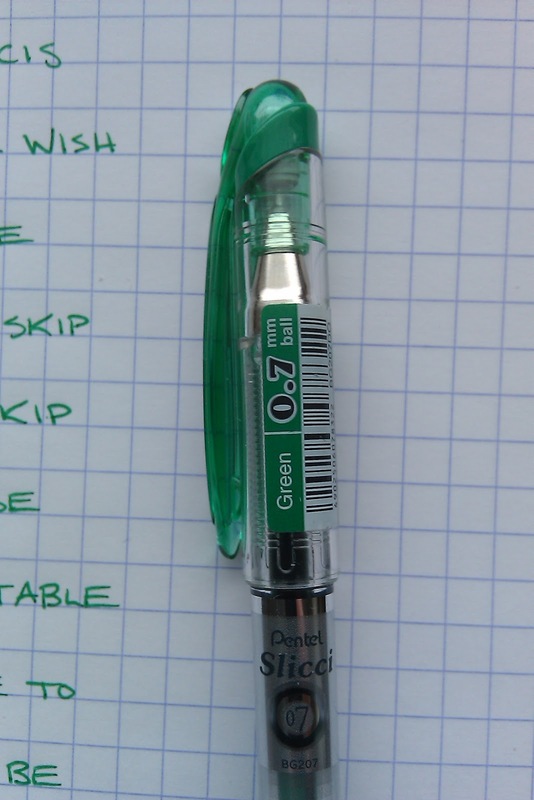 At $2.25 a piece (JetPens), these are great for the money. Go get one. So, I recently received another quickly-delivered order from The Goulet Pen Company (no affiliation), and in this order were two unassuming packages from Noodler's Ink. Those who are familiar with Noodler's will recognize the catfish artwork. The catfish represent the act of noodling, which, if you do not already know what it is, you should just read about instead of having me explain it. It is not only hilarious, but it is also something I will never, ever do. Within this boxes holds one of the most recent/innovative offerings to the pen and ink community, while the other is one of the most infamous and revered. I am talking about the Noodler's Nib Creaper Rollerball, which I believe has only been around for about five months, but correct me if I am wrong. Below it is Noodler's Baystate Blue. This ink is easily one of the most beloved and hated inks due to its vibrant color and unfriendly characteristics, such as a pH of 8-9 (alkaline) and aggressive staining properties. I have had a chance to learn about what can happen from this ink via its cousin - Baystate Concord Grape, which has permanently stained a Lamy converter. The converter not only uses purples, even though it would probably be safe to use other colors, I am just particular about putting other inks in a converter that has been stained purple. As you can see, there is an unconventional film that rests on top of the ink. I do not know what it is, but I am guessing that it is a result of how saturated the ink is. Something about the ingredient that provides such a great contrast means requiring a component that apparently has not diluted into the ink. These colors are not quite accurate. This image would lead one to believe that this blue is bluer than it really is. In real life, this ink has a fair touch of something I can only describe as a neon-violet/blue. Check out Brian Goulet's color-adjusted sample of Baystate Blue here. Using the Nib Creaper Rollerball was great in my Rhodia notebook. The ink, pen, and paper were harmonious, and the writing experience was about as good as it can get, especially with a rollerball. I also noted that the point of the rollerball was smaller than expected. I would say it is probably a .5, but this likely just depends on what sort of paper you use. One huge problem I had was that the pen did not work after the first day of using it. I tried cleaning it out, resetting the nib and feed, and adjusting the ball tip. Nothing worked. Fortunately I had ordered a replacement tip with the pen, which was only fifty cents, but even if the replacement parts are cheap, the pen should have worked a little bit better than it did. I also took a cotton swab and smothered the paper with Baystate Blue. Again, the camera I am using does not accurately portray how gorgeous this ink is. Right now I am using an 8.0 megapixel Kodak, and I hope to upgrade it soon, or at least get a work light like Chris recommended over at Pens 'n' Paper. Closeup of the bottle. All of the artwork on Noodler's ink bottles are original and unique to that particular ink. The Nib Creaper Rollerball comes in a clear demonstrator style. While I have not had a chance to see how long the ink lasts, it looks like it holds a pretty good amount. 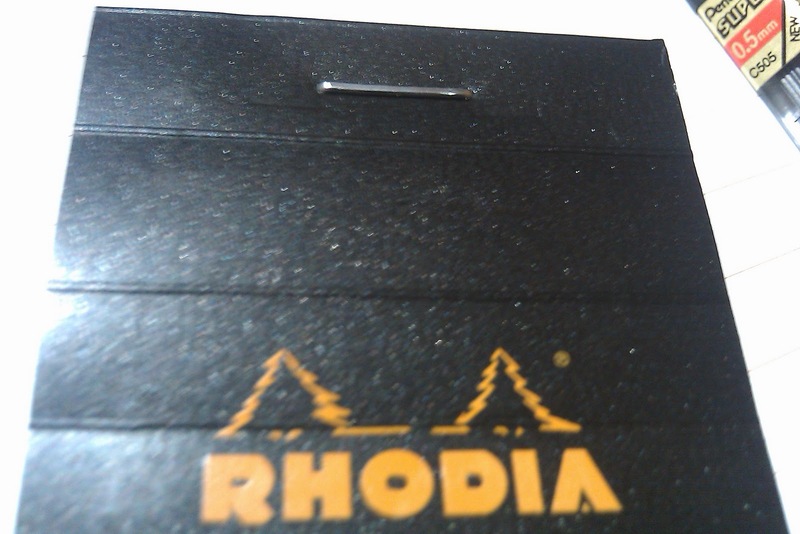 The clip is a basic, functional stainless steel clip. These rollerballs are called stylographs in the fountain pen world. They allow you to use any bottled ink you would like, which opens the doors to having a lot more fun than any other rollerball you will own. And if you keep a ballpoint around just for carbon copies, you are less likely to need one with a stylograph. I wish more companies made them. The piston knob is covered by a 'blind cap.' Both the front cap and blind cap are threaded and twist firmly onto the pen.The motion of the piston is somewhat clunky, but you can always take it apart and add some silicone grease to loosen it up. Closeup of the blind cap off of the piston knob. 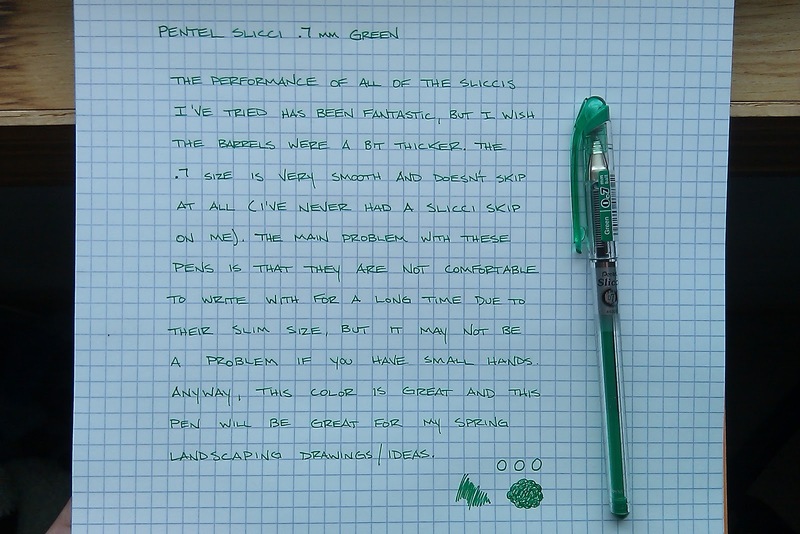 After the pen did not initially write, I cleaned the whole thing out with tap water. In my other demonstrators, this will get all of the ink off, but you can see that this cap is stained and shows the blue stain in the light. You could always use an ammonia solution to get the stains out, or rubber alcohol if you do not have ammonia. You may find quite a few different opinions out there, but you should know that this ink is worth trying, especially if you can dedicate a pen to it as I have with this Creaper. This is a stolen liberated IKEA pencil that I picked up when I was looking for some wall shelving to hold inks, stationary, pen boxes, and my external hard drive. I have been trying to understand the allure of woodcase pencils, but I just can't get into them, especially when there is the Uniball Kuru Toga, Pentel Graphgear 1000, et al. I realized after posting this that I misspelled Scandinavian. I am fairly certain it is a word I have never written before, so I apologize to all visitors of the blog that are of Scandinavian lineage. As you can see, this was not at all pleasurable to write with, but, in a pinch, you have something you can use to make notes of your IKEA products. In a side by side comparison, it is obvious that this pencil is not the typical cedar wood used in pencils, but I do not know what it is. 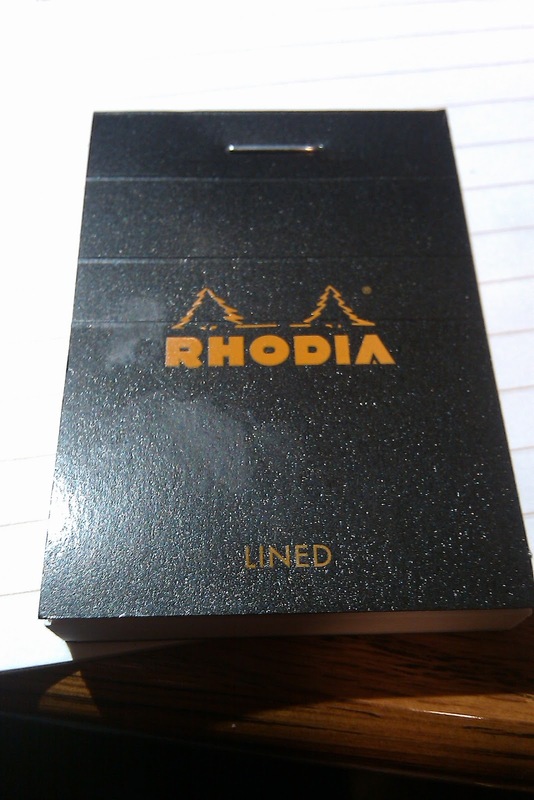 If you'r curious to try out this pencil, you know where to find it.